Kwandwe Game Reserve offers Big Five safaris, guided bush walks, fishing or battlefield and historical tours. Enjoy a great variety of activities while on safari in the Eastern Cape, South Africa. Kwandwe Private Game Reserve offers a range of exciting safari activities from twice-daily game drives in open 4x4 safari vehicles, guided bush walks and fishing to Rhino tracking and unique historic tours whilst on a safari in the Eastern Cape, South Africa. 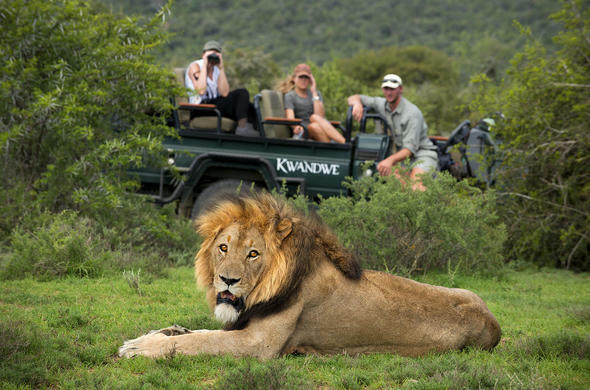 Guests at Kwandwe Game Reserve are guaranteed a superlative Eastern Cape safari experience. African widllife like Cheetah, Hippo, Springbok, Oryx, Greater Kudu, Red Hartebeest, Eland, Bushbuck, Cape Grysbok, Bat-eared Fox, Black-backed Jackal, Cape fox or Caracal call Kwandwe their home. Go on a thrilling Bive Five safari and you might be lucky to see Elephant, Lion, Buffalo, Rhino and Leopard. Kwandwe Game Reserve is a bird lover's paradise with over 200 species found in this area. These include Ostrich, Secretary Bird, Blue Crane, Stanley's Bustard, Crowned Lapwing, Jackal Buzzard, Martial Eagle, Verreaux's Eagle, Pale Chanting Goshawk, Giant Kingfisher, Reed Cormorant and Green-backed Heron. On a Kwandwe safari in the Eastern Cape, South Africa, guests can discover the night time activities of the reserve during exciting night game drives. Elusive nocturnal creatures of Africa that are seldom seen include Aardvark, Aardwolf, Cape Fox, and Porcupine. Guided bush walks allow guests at Kwandwe Private Game Reserve to experience the lesser known aspects of the reserve, including fauna and flora. There are interpretive guided walks or tailor-made walking safaris on offer. Fishing is also available, with Kwandwe supporting 'tag and release' procedures. Children of all ages are welcome at Kwandwe Private Game Reserve. There are a variety of children's activities to keep the younger ones busy for the whole day. Children receive 'Planet maker' backpacks with bug collectors, magnifying glass, a booklet for identifying wildlife and a special craft pack made by the community centre which consists of a journel-making kit for the girls and a door sign making kit for the boys. On the last day, the ranger signs a certificate confirming that the proud child is now a Planet Manager. Another fantastic activity is the one hour morning game drive for children. Go on a Big Five safari, where you can also spot Cheetah and various antelopes. Explore this Eastern Cape game reserve in South Africa and the rich social, cultural, military and archaeological past of the surrounding area. Gather around the stylish outdoor fireplace after an exciting Big Five safari in 4x4 vehicles. Enjoy amazing views and have dinner underneath the South African stars.